H is the second letter in the word of thanks, so today enjoy a second helping of gratitude. Standing as a labyrinth itself in this design, you can enjoy its simple trail of sloping lines or walk any labyrinth with the idea of gratitude and the expression of it. 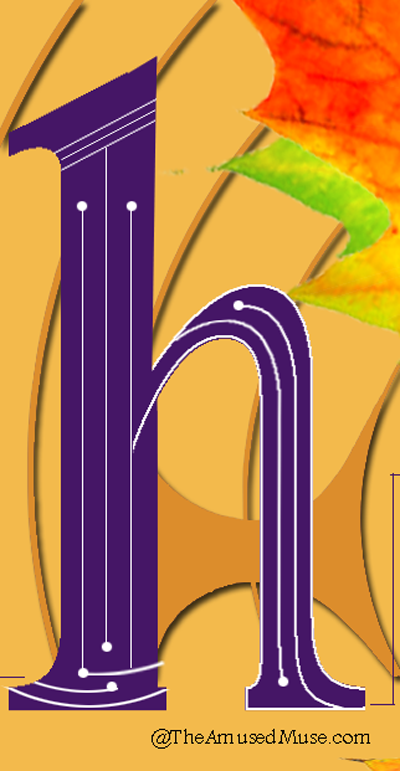 Let the bottom of the H become your centering. Help others to know and navigate the path with your assistance, education or insights. Helping naturally elevates the expression of thanks for the helped and the helper. Walk into the labyrinth in the the ways you have been helped and walk out with the ways you have helped others. It naturally brings a desire to thank, raising the essence of our gratitude in a simple walk. Take a walk around the labyrinth of your choice today with the thanks in mind and consider how these seven words that begin with H might assist you in the way they convey thanks. Use one on each circuit of a seven path labyrinth and walk mindful of the way they serve and the thanks they naturally bring. Honor is an esteemed place where gratitude is known, enough thanks and we honor the essential nature of gratitude more fully. Having might also feel an abundant and expressive of thanks. Having is a general indicator of being in the possession of something and when we are, we often extend our thank you. Happiness can bring a sense of gratitude forward by the jubilant feeling presented in being happy. We say thank you more when we are happy. Heart focused is a place that aligns with gratitude as when our heart is of concern, focused and centered, thanks is not far away. Healthy is something we are all grateful for, as with our health we can do more and better. It is reason enough for great thanks. Humility is a great source of uncommon peaceful presence in the face of great experiences. It is a place for a heart full of thanks. Heroes play a role in shaping our lives as we follow those we respect, admire and hold gratitude for. Our heroes big or small hold our thanks given in showers. Consider those you honor, heroes, who have healthy humility and heart and you will know a happy walk of thanks in this day. As you walk in with these, see yourself as these on the walk back out… and know greater thanks. Share and become part of Labyrinth History..
Every time I take a turn, it is a new opportunity and a possibility. Using the most basic style of labyrinth, I added color to my possibilities. I like to experience life a little lighter and see more opportunities in my experiences, so polka dots seem to be a lively and light hearted reminder to turn into something more purposeful. Because in life, I love to play with possibilities and the labyrinth is a constant provider. How do you take the turns in life? How many do you notice, even in your walk? What are the possibilities that present themselves? The Labyrinth of plastic waste is designed by Spanish activists who want to bring attention to our cultivated consumption of plastic. The installation of art and statement took four days to fashion into a labyrinth of light using 26 meters of plastic waste using over 6,000 bottles encased in plastic bags to illustrate their message. The installation has been recreated in Katowice, Poland, Buenos Aires and has been a part of public portrayal in museum spaces and in Madrid. The artists make many statements about our plastic addiction in an artistic way. By day the clear plastic makes an impressive statement hanging from a metal frame structure, though at night it becomes magical when illumination is added. The great Leonardo Da Vinci invented plastic and like many of the inventions he created, not all had a favorable outcome for society’s growth and continuation. Like our purpose in exploring we can find the great invention and intentions, though the reflective walk that brings us back to our starting point offers a new beginning in seeing the whole picture more clearly. Explore the ideas that you have seen the other side of in your walks to equate the value of moving into new beginnings. Whether it is in the programming you offer for education, the design you build to provide insight, the artistry you create to share perspective or the unique ways in which you walk or connect to embrace an experience, how might those unique differences speak to your journey and yourself in the year that lives more honestly in who we truly are? Today’s design comes from the Oregon coast where artist Denny Dyke makes a composite of symbols and designs of the labyrinth into one walking experience. The wonder is in the artist who simply puts together the things that are important and combines the pieces to make one whole experience. Today discover how can you make more out of more labyrinths. 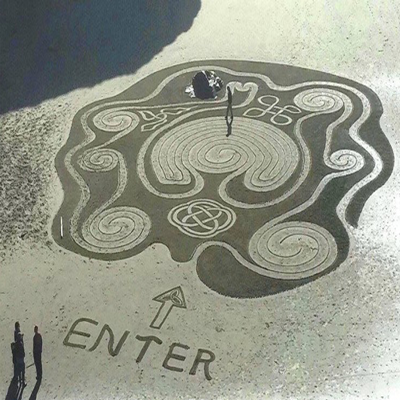 I’ve often put together many labyrinths for one experience so can relate to this Artist and appreciate the reminder to be barefoot into the goodness of what nature provides. Where you don’t have a beach, you might have a sandbox or a box for sand and finger designs. 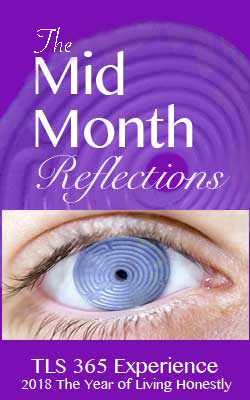 Explore an idea of an area of your life this month where you would like to get out of the box of conformity. 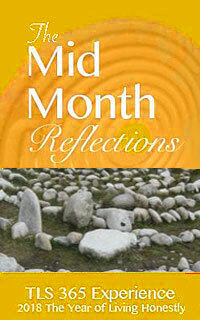 Finding the day busier than expected, time for reflection moved later and later into the day. Finally, a chance to stop and refresh presented itself and while waiting in between, the colorful straws on the shelf in a glass cylinder made for a quick design with fun in mind. While many intense moments can be wonderful in the education and application of a meaningful experience, the moments to step away and rejuvenate body and mind can be profound in importance and production. Even with wonderful intensity, moving away from the magnetizing spiral of consumption benefits more with a new perspective. As the focus this month moves us inward with a concentration of the motion and matter of the spiral; work, rest and play are a triad of balance in what we can get caught up in. Designing, and tracing this labyrinth of triangular function while taking time out, the three important focal points of the day resurfaced in this design. Something as simple as bending straws became a pleasurable new direction of intention and non intention. A triad seemed to want to express itself in the straws and as it did, it reinforced these three concepts with each fold and turn. By the time I had reached my last straw, what brought the three together became purposefully clear and somewhat amusing in the minimal ease that occurred to provide this insight for the moment and for the larger project I had walked away from. Not all spirals are circular and not all intensities need be difficult, hard or troublesome. This was intensely brilliant and in playing with straws, a number of messages arrived in a way more expansive processes might have missed. It evidences my belief in the value of play over and over again in its genius method of finding what is truly important. Playing with the labyrinth in walk, process or design seems to provide endless creativity that brings all points together. Today, there was a triangulated triumph. 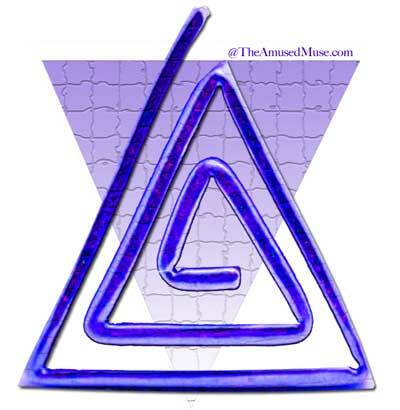 Today triangulate what is important and discover three main points of focus and as you move in, center and move out, find a triad of truth in what it opens. 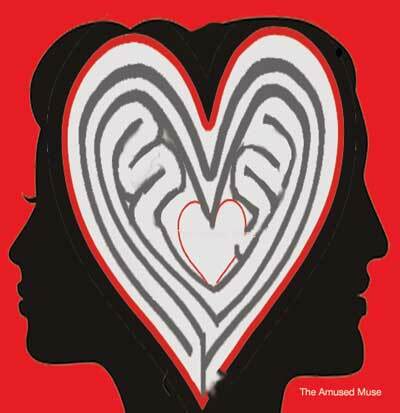 In the essence of love comes the considerations of the greater capacities of men and women. As changes occur in the vastness of the world and feminine wisdom rises, the honest truth of what we are all capable of will be the rising point that moves us forward as humanity. When we love our differences, are honest about the fact that evolution is occurring and seek to improve the quality of all lives, the right of who we are will bring us into a place that elevates the status of humankind in both women and men. After a talk of just what it might take to ease the conditions of change now facing the roles of men and women, the walk of the collective on the labyrinth seemed to bring more realization to the moment and many epiphanies were met with personal solutions. Walk on your changing role and what you might like to realize more of. There is a moment of utter delight when opening a gift that was carefully selected and offered with the love. This holiday I received just that gift and I think just watching the opening of it was quite of love for the recipient. 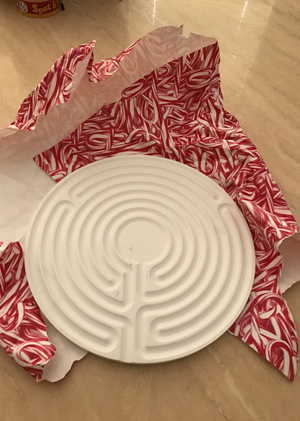 A recent injury sidelined me from daily walks on the labyrinth and while it gave me plenty of opportunity to draw, create and follow the finger paths, at this point in my journey of the labyrinth, I hadn’t owned a finger labyrinth that had any dimension. Opening this gift and discovering the fine marble design was truly a gift of love as it came from my husband and kids who didn’t seem to have much interest in it. I couldn’t help but experience the first finger walk out loud expressing gratitude in each path for each member and as I turned sharing how each had made me feel. Somehow I filled each path with all that I felt and in reflection shared how this gift had brought the love of family, the joy of delight and the peace of goodwill forth. Our new Stanwood (Washington) Labyrinth Committee was formed last fall and is working towards a permanent labyrinth in a new city park within the next few years, with total and enthusiastic support from the city! They even offered us the use of a Planner to sit in on our meetings! The latest exciting development is that our beautiful new YMCA has enthusiastically agreed to host a World Labyrinth Day celebration and space to organize to develop a special Family Day that is both free and open to the public. They are dedicating the gyms for walking multiple labyrinths, a community room for showing the TLS video, a room for talks and refreshments, and space for kids’ activities. It’s amazing, all I did was ask and look at what I received. So who can you ask?…..
Our Journey has begun. Today March 1st marks the new beginning where the transformation from exclusive club (365 Club) moves to inclusive Experience. 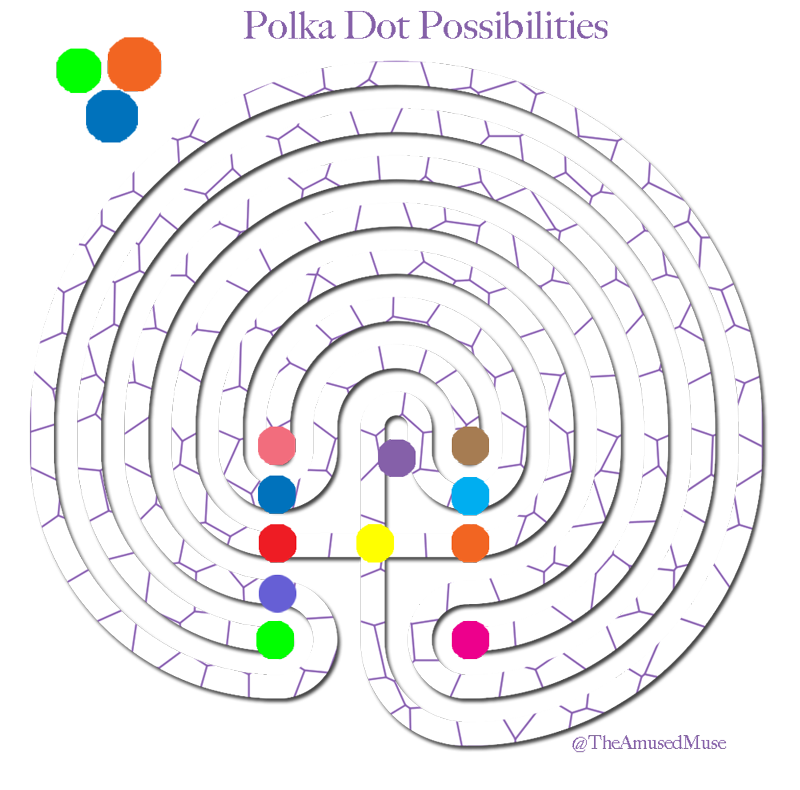 In this method, we invite all to be more aware, educated, applicable and contributive in the ways and meanings of the labyrinth. The first quarter sparks awareness and where the daily message shares a contributor’s experience, the opportunity to use that experience and share your own is great and giving. This helps the experience to be a wonderfully recycling opportunity. I shared the first experience as its designer and developer. Welcome to the first day of the 365 Experience. Our very first sharing offers a way to walk with New Beginnings. Please experience it in the way that most appeals to you. As you come to walk the labyrinth, stand in the gateway of it’s beginning and invite yourself to a place of “New Beginnings”. Use your breath as a tool of guidance and awareness, inhaling any thought that pops up to join you along a length of the path that extends before you, and exhaling a release of the thought with your breath as the automatic point of turning offers you a new direction. As you arrive in the center, bring your attention to your body response. Experience the pace, depth and the way your body responds to both new breath inward and the way in which you exhale your breath’s completion. Continue your walk as you are internally prompted. As the mind relaxes and the body notices it’s own flow, allow the awareness to expand to your soul and spirit in the reflective return of your journey. With each outward step, reflect on the inward wholeness that develops as the soul merges the mind with matter. Today marks the presence of the labyrinth in the world as a global consciousness forms to celebrate this unique tool of reflection and insight. It is World Labyrinth Day and today marks the fifth anniversary of its inception. Years ago members of the labyrinth society gathered to form a focus to grow labyrinth awareness in the world and for a spot of time it was recognized. In 2009 Dr. Stephanie Blackton rallied the concept and brought the idea back into our presence and the lead has shifted to Carol House of the labyrinth society to keep the path alive. This year an overwhelming support is happening and the wave in the world of walkers began yesterday as noted by this Chicago author and will continue with energy and presence around the world. What is significant is that there is a a lot of feeling attached to the labyrinth whether it is thought of as energetic, numerically connective or spiritual and that type of consciousness is flowing today. A theme I came up with in 2009 was to walk the world as one at one. At one pm in whatever time zone a person might be located, there would be movement. It wasn’t a new concept for me as I have done this with other programs and purposes so I was happy it was universally accepted by the committee that Stephanie put together. I also designed this image for the world to share as to me..for just one day we might be as one with our thoughts and that might simply spread to all those we would come in contact. On a global level that is large to consider. May we be that present and fortunate to glow in that knowing!